I stamped and fussy cut this image ages ago and decided to do something with it today. I used Prismacolor pencils and the gamsol technique to colour it. We used to have an old VW this colour when my boys were babies. It was too difficult to get 2 kids into child seats in the back so we had to sell it. I remember it fondly though and since I usually smile when I see a VW I'm going to link up to the challenge at Cuttlebug Mania where the theme is "to make us smile". Hope I'm not stretching the things too far! At Simon Says Stamp Monday Challenge the theme is anything goes. 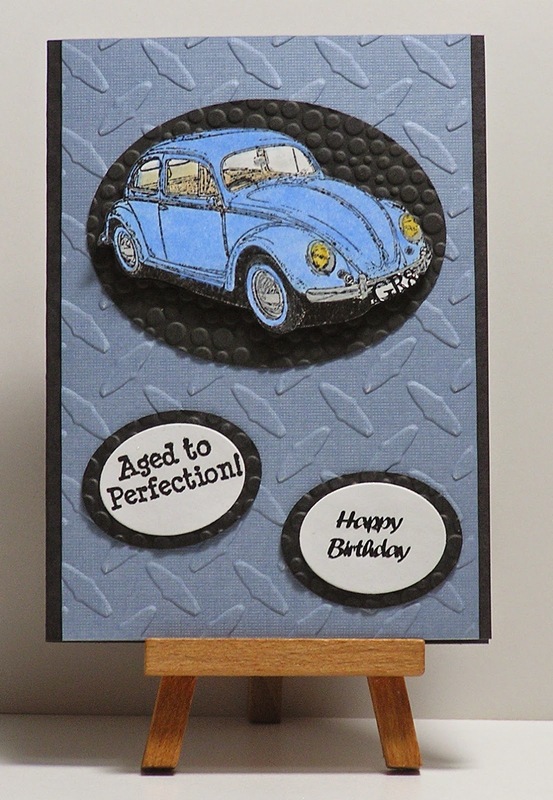 At Simon Says Stamp Wednesday Challenge the team is celebrating their 5th year of challenges and want to see happy birthday creations. I'm also linking to a couple of challenges that are new to me. The Crafting Cafe where it's one for the boys. Stamps: Deep Red VW; Art Impressions aged to perfection. Embossing Folders: Tiny Bubbles & Heavy Duty. Birthday sentiment sticker from stash. Such a nice male card. I like the witty sentiment. Great card and saying! Doesn't it feel good to use something that you have had lying around in your stash for a while? Great card, I love that textured background, perfect for a male card. Thanks for joining us for this week's Simon Says Stamp Monday Challenge! Great Masculine card, so perfect for our challenge too!!! Thanks for linking up!!! I forgot to tell you how great your embossing is too! Thanks for joining us at Paper Craffting Challenges! Very pretty card. I love colors. Thanks for playing with us t Fussy & Fancy challenge. Super card! I love that image & the embossing is fab! Thanks for sharing at The Crafting Cafe in our One For The Boys challenge this month!